Lower back exercises when done properly can significantly reduce low back pain by activating muscles of the low back and “core.” 80% of people will experience some form of low back pain in their lifetime. Therefore, people should be doing some kind of exercise for the lower back to prevent injuries. The typical person who sits most of the day will present as a mechanical low back pain case which is non-disc. Mechanical low back pain persists when a patient uses the wrong muscles to load the joints. Start on knees and advance onto feet. 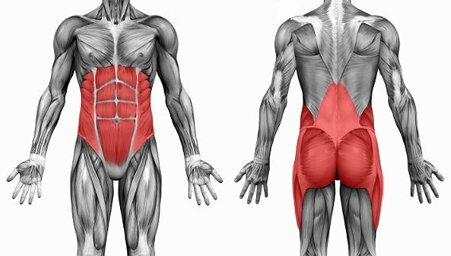 Activation of the transverse abdominus (core muscle) contributes to low back stability. Hold the bridge for 3-5 seconds for beginners and do 10-15 reps. Advanced side bridge can be held for as long as possible for endurance. It’s very important to brace the abdominals first. Stretch opposite arm and leg out and maintain a slow controlled motion to maintain activation of the core and glute muscles. Brace the abdominals first. Then squeeze the glutes together and bridge up. This is a very good exercise for gluteus maximus activation and is key in lower back rehabilitation. Feel the hamstrings and lower back to make sure the glutes have the most tone. If the glutes don’t have the most tone go back to glute squeezes until this occurs. There are 3 planes of motion sagital (front to back), coronal ( side to side), and transverse. Every muscle and joint must be able to move in these planes of motion. So, to properly train the glutes movement must occur in 3 planes of motion. This list of lower back exercises is non-inclusive and for the sake of this webpage just the most common and/or basic version of each exercise is discussed. Please consult your physician, chiropractor, or physical therapist before starting an exercise program. To schedule a no obligation consultation with your Indianapolis chiropractor to discuss your back or neck pain, please call 317-228-9701. Note: Same day appointments are available.